Detectives are appealing for information after a major incident in Burnley this afternoon in which at least one man was taken to hospital. 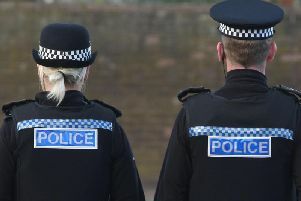 Nine police cars, a North West Air Ambulance helicopter and armed police officers were called to a terrace property in Stroyan Street, after reports of the sound of gunfire. A Lancashire Police spokesman confirmed officers had been at the scene this afternoon dealing with what appears to be a serious incident. He said: "We were called today at 3pm after reports of a large disturbance outside a house in Stroyan Street, Burnley. One of the calls reported sounds of a gunfire. In another call we were told that a large number of men, possibly carrying machetes had entered the property, but then left. Police arrived at the scene and searched the premises. Investigations are continuing and one man remains in hospital. We cannot say anymore than this at this stage." Anyone with information should contact Burnley Police on 101.